President Miyake talks how Mitsubishi Space Software Co., which had fully devoted itself to the space development program of Japan for many years in the area of software and the system development, as the company name suggests, has changed and evolved recently, at the World Trade Center Building, Tokyo. The most effective way to rescue in disasters should be the approach from air when the ground road or communication facilities and cables suffered crushing damage by a disaster or when activity on ground was completely paralyzed with a fire and a muddy stream, the building which collapsed, danger of a poisonous gas more.” NICT’s high altitude wireless network system for disasters is reported. 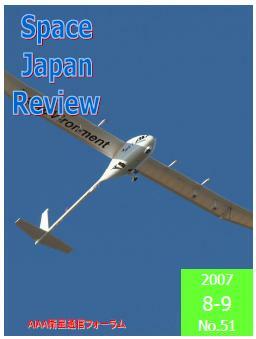 The 25th AIAA International Communications Conference (ICSSC 2007), which was held at the Convention and Exhibition Center (COEX) in Seoul, Korea, from April 10th to April 13th in 2007, is reported. The main theme is “Evolution Toward A Ubiquitous Network Society”.